George John William Flower was born in February 1851 at West Knighton, Dorset, the son of farmer George Frederick Applin Flower (1815-1893) and Jane Chilcott née Groves (1825-1899). In the 1851 census two-month-old George and his parents were living with his father's brother, also a farmer, at Piddletrenthide, Dorset. In the census George's father gave his occupation as 'farmer of 380 acres employing 20 labourers' while his uncle John gave his occupation as 'farmer of 160 acres employing 23 labourers'. The 1861 census listed 10-year-old George as a boarder at the Kingston School, run by John Aldridge in Kingston. By 1871 George was living back with his parents and eight younger siblings at West Stafford, Dorset. His occupation was listed simply as farmer's son. In the summer of 1878 at Lambeth, London, George married Eliza Jane Darby of Cirencester, Gloucestershire, the daughter of Robert Fryer Darby and Anne née Palmer. 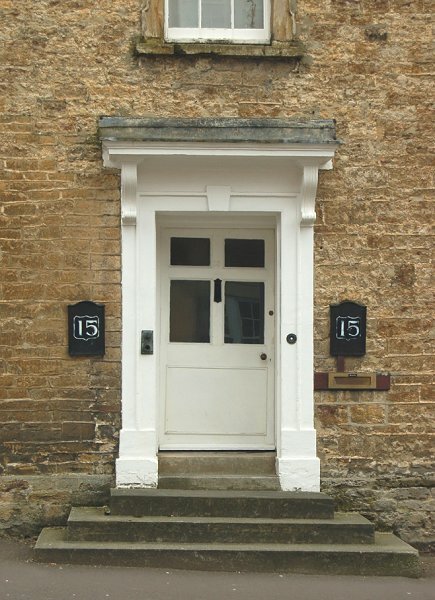 Following their marriage George and Eliza moved to Yeovil and the 1881 census recorded them living at 19 High Street with their two sons; George aged one and Norman aged four months, together with a nurse, attendant, housemaid and cook. 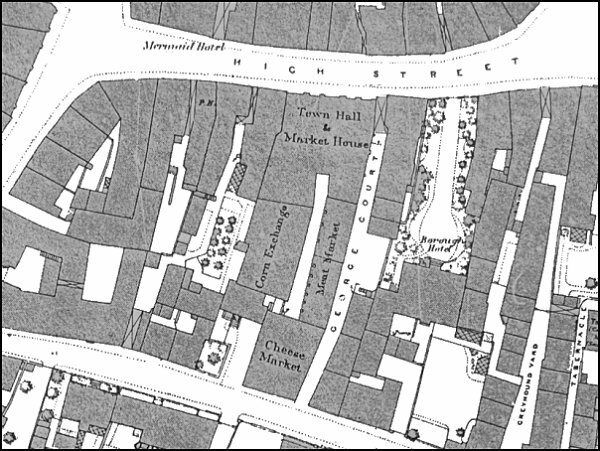 At this time 19 High Street was the building in the Borough that had previously been the Bell Inn and in the 1886 Ordnance Survey was shown as the Borough Hotel. George listed his occupation as Surgeon and General Practitioner but it is not known whether his medical practice was in this building or, indeed, if his wife was running the hotel since they were still living there in 1891, albeit without their two boys who were away at school. There was, however, a boarder, a nurse, a cook and a parlourmaid. 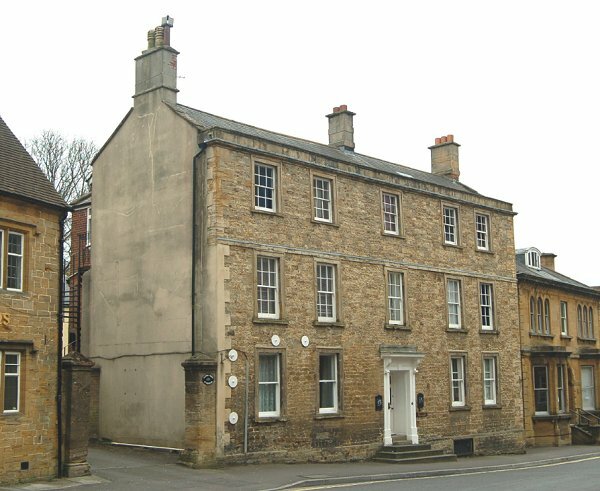 The building was purchased by Yeovil Corporation in 1898 and was adapted for the Corporation's use as the town’s first municipal offices, called Borough House. It is likely that George moved his family to Hendford at this time into the building now known as Flower's House. At the time of the 1901 Census their new home was listed as 8 Hendford (today it is 15) and George and Eliza were living there with their sons, George and Norman, both listed as Oxford Undergraduates. George simply listed himself as a surgeon. In the 1911 census George, now aged 60, and Eliza now aged 57 were still living at 8 Hendford with a cook and a parlourmaid. George listed his occupation as 'Surgeon (Medical)'. George died in the spring of 1917, aged 66, and Eliza died just a few weeks later on 5 May. Her will was proved in London in August by their son the Reverend George Augustus Vivian Flower, and the effects totalled £6395 1s 8d (in excess of £375,000 at today's value). Their younger son, Norman, carried on his father's medical practice at Flower's House during the 1930s and 1940s. Thanks to Tony Robins for his recollections of the time Norman Flower was running the practice - "You went in there in the morning and said "Can I see the doctor please?" The doctor would call you in and say "What's up with you?" He'd give you a quick once-over and tell you to come back in a couple of hours. When you returned later that day, your medicine would be waiting for you on the mantelpiece of the waiting room." The 1886 Ordnance Survey showing the Borough Hotel, with its long front garden onto High Street, to the right of George Court. 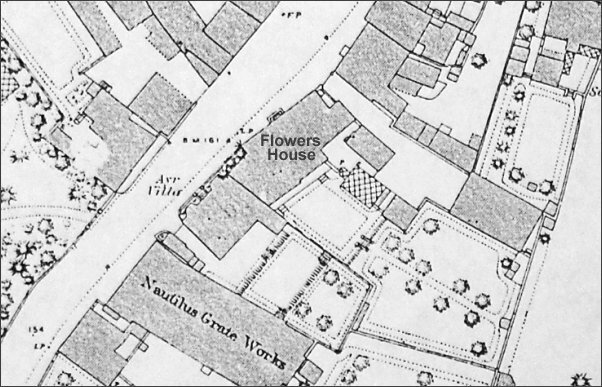 The 1886 Ordnance Survey showing Flower's House in Hendford at centre with its extensive gardens behind. 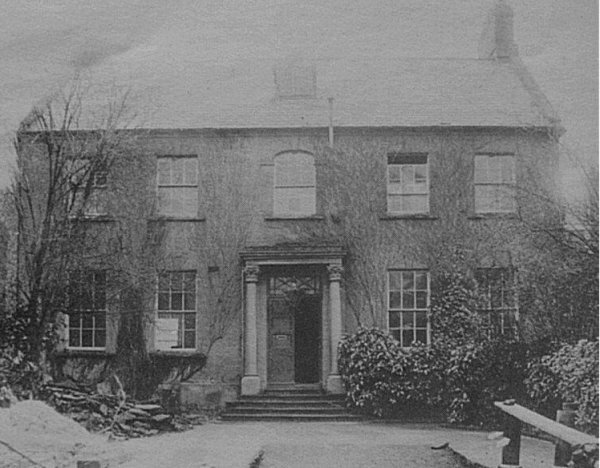 A photograph of the residence (and possibly medical practice) of George Flower, the former Bell Inn, taken about 1880 when George and his family were in residence. 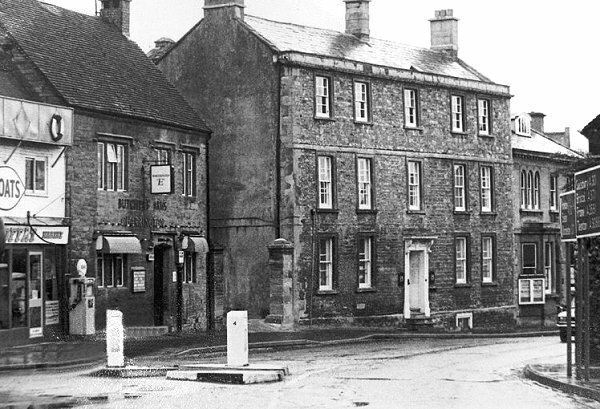 This photograph of about 1915 shows the residence of George Flower and his family, the former Bell Inn, at left, set well back from High Street. By the time of this photograph the building was called Borough House and was used as municipal offices. 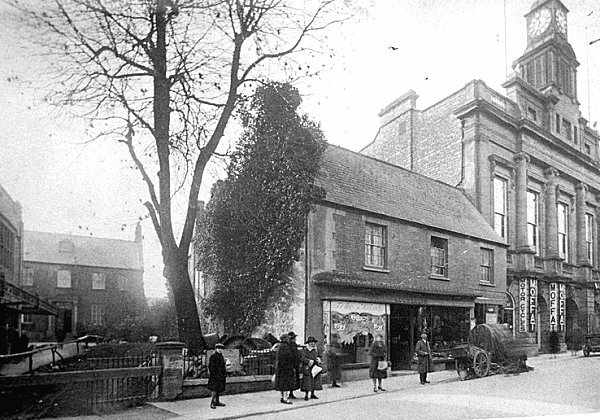 The tree and shop at centre are in the position of where King George Street now joins High Street and the tall building at right is the old Town Hall (built in 1849) with its tower and gas-illuminated clock, installed in 1912.